tl;dr: Life is about to get a lot better for demand response and energy efficiency companies. One of the challenges of venture capital is that you invest in companies now based on what you know now, but the world may look very different by the time the company exits (i.e., when it’s bought or goes public). However, one can also make the opposite blunder: Deciding not to place bets in a downer environment, and then missing the opportunity to reap returns when things look up. This is the milieu that demand response and energy efficiency start-ups face today. This situation is about to change. What’s the value of a marginal megawatt? In my mind, it should be proportional to two things – 1) the cost to deliver that same MW from conventional generation resources, and 2) the amount of free capacity that’s available to do the generating. Both are hitting inflection points right now. First, let’s take the marginal cost per MW. For this analysis, let’s consider the market for “frequency regulation,” a horrible misnomer of utility-speak that means “injecting or removing power on the grid over fine time scales to balance supply and demand.” (The name comes from the fact that imbalances cause the grid to deviate from its 60 Hz AC frequency.) Frequency regulation is traded in open marketplaces on a $/MW/hr basis, and its price is probably the purest measure of a marginal megawatt. Natural gas prices started plummeting in 2008 due to the hydrofracking revolution and reached a 12-year low of $1.82/MMBtu this past April. As that price was below most producers’ breakeven levels, many folks speculated that drilling only continued because the exploration companies would lose their land leases if they didn’t keep making holes. Since then, new drilling in gas plays has cratered and the price has started climbing back up – it’s at $3.15 as of this writing, and the futures market has it north of $4 by the end of next year. As the price of natural gas rises, so will the value of marginal megawatts. And there’s reason to believe that the price will increase sharply beyond 2013 if U.S. natural gas starts getting used in new ways – like being exported. Export applications currently filed at the DOE would ship out 16 billion cubic feet per day, which is two-thirds of current U.S. shale gas production! 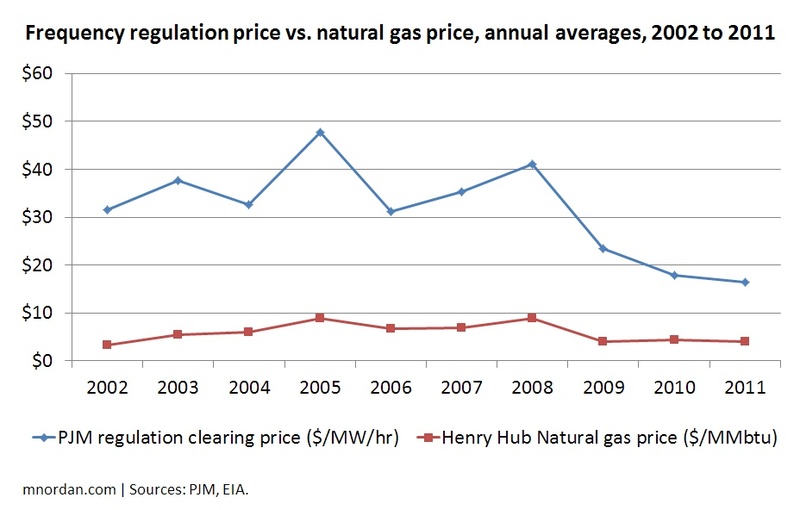 So higher gas price = more valuable marginal megawatts. Now let’s look at generating capacity. As goes GDP, so goes electricity demand. When U.S. GDP peaked in 2007, so did our electricity consumption. And when the economy tanked, electricity consumption fell. 2012 should be the first year that these indicators exceed their 2007 levels. So do I need to write this next paragraph? Only now is electricity demand getting back to its 2007 peak. Doubtless there were new plants getting built five years ago which were completed but unused, so excess capacity will likely persist for a couple more years. But, inexorably, that capacity will get mopped up as GDP rises and electricity demand grows with it, and sooner or later we’ll find ourselves bumping into a new ceiling. Just as predictably, the value of companies that resolve this supply/demand imbalance – those that deliver marginal megawatts – will jump. Note that when Enernoc went public right before the 2007 electricity demand peak, it did so at 20x the previous year’s revenues. It’s now trading at 0.6x. I’ll bet that looks really different in, say, 2016. The kicker: Demand response and energy efficiency companies will slaughter conventional generators on cost. A new fossil generator costs $1 million per MW in capex, plus or minus, and requires fuel and transmission on top of that. Setting a big user of electricity up to curtail its demand by 1 MW costs maybe $50k – and that’s it. As we climb to a new electricity peak, generators will lose the battle for the marginal megawatt. 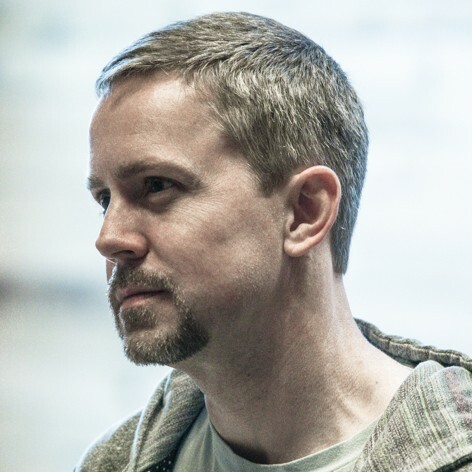 So whether your start-up is trimming peaks, lowering baselines, or synchronizing supply and demand, take heart. It’s been a long, hard five years. But a brighter day is just around the corner. This entry was posted in Demand response, Energy efficiency. Bookmark the permalink. Change is definitely afoot — I talked with the CEO of a big ISO a couple of weeks back and he kept using the word “chaos” to describe what’s happening in electricity markets now. The rule change you referred to (FERC 755) should be a positive for demand response because it compensates fast-responding resources more than slow-responding ones, and changes in demand are generally faster than ramping up a generator. What I fear is the unintended side consequence where too many demand-side resources come online and pull down the price. This is what happened in NYISO over the past few years. Exactly…same fear here. When I hear every new storage, lighting, thermostat, etc. company talking about addressing this market my hypothesis is that at least in the short term this is exactly what will happen. Once there are more intermittent renewable power sources on the grid (and US GDP increases) the need for frequency regulation or demand response will increase, but I fear we’re going to see many new market entrants trying to provide the exact same service and low prices will remain at least for some time. Interesting analysis. There’s another dynamic going on supports your argument that may be relevant in regulated markets such as California. California rate payers see very little correlation between gas markets and capacity tariffs rate payers actually pay. Instead, smart grid, renewables and energy efficiency (as well as a crappy economy) drive costs up and revenue recovery down, meaning that rates must increase. That’s the major dynamic causing structural long-term rate increases in California. Really brilliant and well grounded forecast of NOW realities for TOMORROWs MW. Generators will lose the battle for the marginal megawatt if they do nothing TODAY during off-peak time. The best conclusion – which is the true game-changer – a brighter day is just around the corner. Don’t see quite the rationale for being bullish on electricity markets – there really is a lot of shale gas and probably not a whole lot will be exported. Believe it or not, energy efficiency programs have also taken their toll on load. So has the departure of manufacturing, much of which is not coming back. 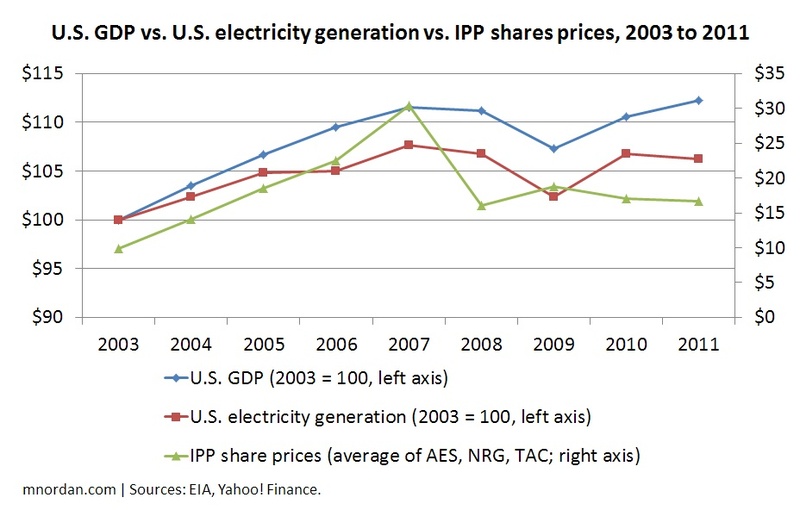 This is a generalization of course, since there is no single US electricity market. Texas will remain volatile for a while. In the long term I agree, demand will catch up, then the problem will be that no one will be able to build a merchant plant so there will be generation shortages except where states hold RFP’s or have vertically integrated utilities and integrated resource planning. The Enernocs of the world are down for a reason – their product has mostly saturated the market and while it’s easy to say it only costs $50K per MW of demand response capacity, the marginal costs of demand response are higher than almost any other fuel: it’s the opportunity cost of that customer (be they WalMart, Alcoa, …), the value of the lost production they could have had, the inconvenience the power cuts impose. WalMart has to send home workers during its demand response events… they bear the costs in lost wages; now THAT’s good for the economy. And, unlike a generator that can produce energy for an unlimited # of hours, demand responders mostly have limited #’s of response hours. But though it’s an energy-limited resource, not a capacity resource, they get the same capacity payments as baseload plants, notwithstanding the few # of hours they can realistically be called (maybe 10, maybe 60). It’s really just regulatory arbitrage. For a an energy efficiency company that really adds value instead of shuffling it, check out Ameresco. Good to hear from you Dinos! I wouldn’t disagree with your point re: DR in the capacity markets (I also don’t think it’s a secret, but rather an explicit FERC aim). DR in the frequency regulation, spinning reserve, and (soon-to-be) ramp markets would seem to be a different beast, however. I agree with you especially on the fact that so much is centered around that peak capacity need because that is what drives the regulators to approve/deny new capacity investments. Natural gas is pinning a huge uncertainty around the markets not only with the recent low rates but more so with the incredible volatility. 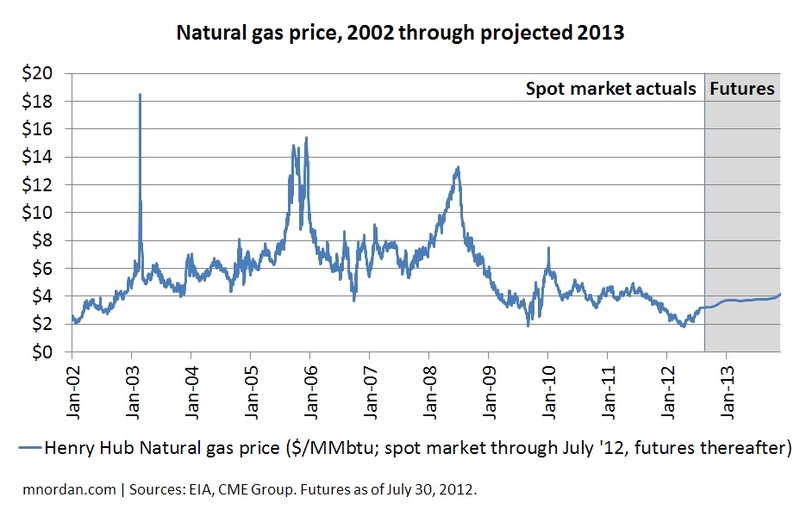 Much like predicting hurricanes, by adjusting historic pricing ranges 5 years versus 15 years, there is no telling where natural gas is going. The other attribute you will start hearing a lot from utilities and advocates is the access and availability of cool water. With the current drought conditions, production levels have been reduced dramatically which adjusts utility and regulator strategies again. Yet regulators place little to no value on energy or efficiency measures as it pertains to offsetting water needs. As new technologies and building management methods come into the market it is important to remember that energy and efficiency is a financial sector. The best technology without a consumer facing financial product will struggle. Not in any way a pitch BTW, just offering an interesting macro economic consideration of the future(s).